Grad Housing’s pilot compost program in the Hilgard Apartments is off to a great start! Within a few days of implementing the program, we received our first heartfelt email of support from a graduate student living in Hilgard that made the long and arduous process all worthwhile. This particular student included details that she has already taken down four bags of organics to be composted and has not had to take down a single bag of garbage – exactly the result we wanted! This positive feedback has shown us the desire of students to make a difference and that, although the pilot project is underway, our work is far from over. Last Thursday, we spread awareness about our project at the Earth Day Fair and asked members of the UCLA community for feedback as well. To show our appreciation for those who took the time to fill out our surveys and learn about reducing landfill waste, we handed out mandarins and had our compost caddy ready to collect the peels. In addition, we will be sending out a survey to all Hilgard residents to gather more student opinions, suggestions for us to improve the system, and (we hope) support to see the compost program expanded to all university housing. We are excited to use these results to demonstrate the success of our program and help move UCLA towards our “Zero Waste by 2020” mission. 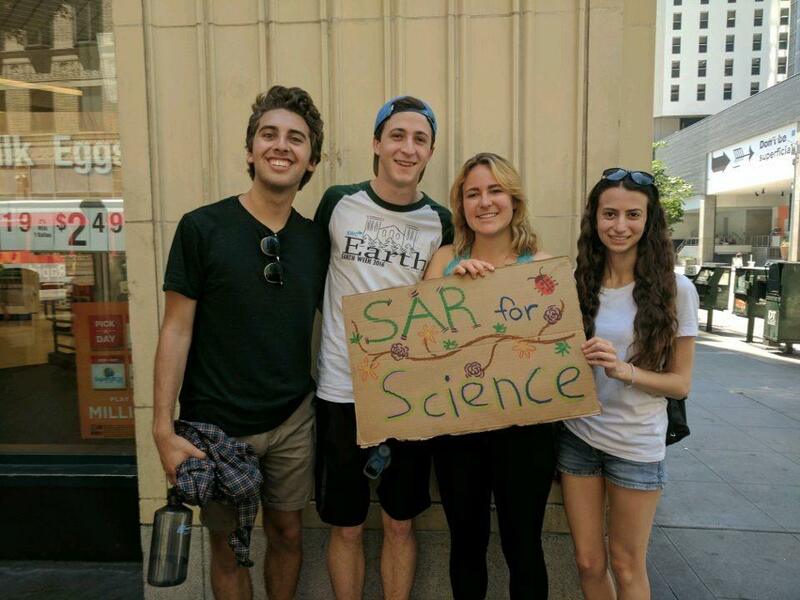 This past weekend, our team celebrated all our hard work by joining SAR at the March for Science and for an amazing camping trip in Carpinteria. Our Grad Housing Team has received tons of support working at UCLA, and it was great to be part of such a large and diverse crowd marching for science and advocating for a better environment. At the campsite, our team got a change of scenery from office meetings and long nights in libraries to nature preserves and ocean views. We are now recharged and ready to keep fighting for our planet!